The first chance to fish against Mark in the 2014 Mark vs Mark competition and we decided to go visit Pebs at How End. 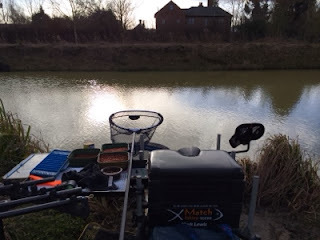 I sent Phil (Pebs) a quick message and it happens to be a winter league team match on today and he was short of anglers, so Mark and I were quickly drafted into the team. The weekend weather had improved a little since last week and I was looking forward to fishing How End again. Great to see some of the locals, Baz, Trevor and Big Ben who I saw last weekend. All gathering in Peb's tackle shop, both Mark and I would be fishing Yasi's lake, which was my preference as I've not had the best of times of previous visits to Dani's lake. I almost got to the front of the queue by pushing past Trevor who quite rightly put me to the back of the queue, mumbling words such as, "cheeky young product wearing geordie..."
I pulled out Yasi's peg 13 and Mark got peg 6.